Cheltenham ice rink is open! Even better – brag to your friends that you helped out at the rink. We need volunteers! 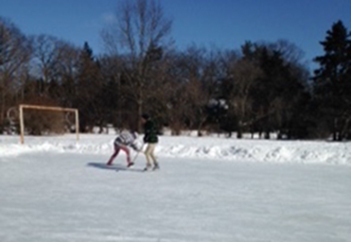 Please send an email to keithwilhelm@rogers.com if you would like to help maintain the rink. Most importantly, at this time of the year, we need people to help shovel and flood. Please come and enjoy a great Canadian tradition – outdoor ice skating. Teenagers play hockey, little kids learn to skate, age groups are mixed and a great place to gather to enjoy a great Canadian winter! A special thanks to Doug Jones, the Parks Supervisor who has worked on behalf of the City to provide us with flood lights, hoses and access to the water necessary to flood the rink. The Cheltenham rink is an all volunteer community project. The LPRA provides support for this important community initiative.